Of course, you guys know I've been a long time reader of 6 Bittersweets for a long time. I'm obsessed with her creativity and she has a knack for finding the most delicious recipes around - I just made her Ricotta Blueberry Hotcakes and I was in heaven! I literally can't wait to find the perfect event to make her sesame & matcha cupcakes. I was so excited when she agreed to do a guest post on my blog and I hope you all enjoy - it's a real treat! When Michelle invited me to guest post on her blog, I was giddy with excitement. It's not every day one gets asked to contribute to such a gorgeous collection of food, fashion, music, and photography! Especially after she shared those amazing cinnamon cupcakes with my readers, I knew I had to bring her a special treat. Thanks so much to Michelle and all of you for having me! One thing you should know about me is that I love fresh fruit. Whether at the supermarket or farmers market, my basket is always brimming with whichever fruits are in season. But they taste so good out of hand that I just eat them right up. They rarely survive long enough to show up in a blog recipe 8). 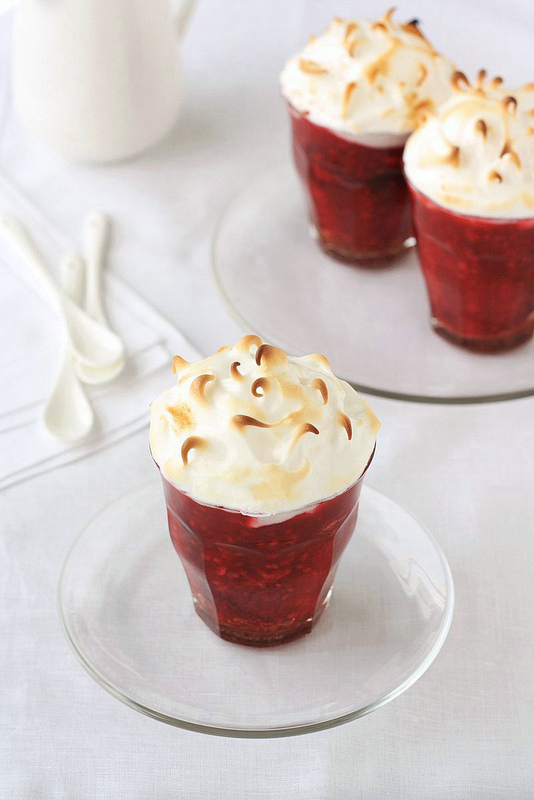 Then I found these stewed fruit pots topped with pretty meringue. And they are really worth having a little patience for. What I like most about this dessert is that it looks fancy but can be whipped up so quickly. Couldn't we all use more recipes like that? But what about the taste? Well plums happen to be a fruit I find yummier when cooked. Here they're quickly stewed to coax out more sweetness and a silky texture. Combined with a delicately toasted meringue topping and almond cookie crumbs, the pure fruit flavors are enhanced but not at all masked. These pots were a great change of pace from my usual cupcakes and cookies and would be lovely for any get-together. NOTES: Feel free to swap out the fruit here for any fresh seasonal or frozen fruit you like or have on hand! 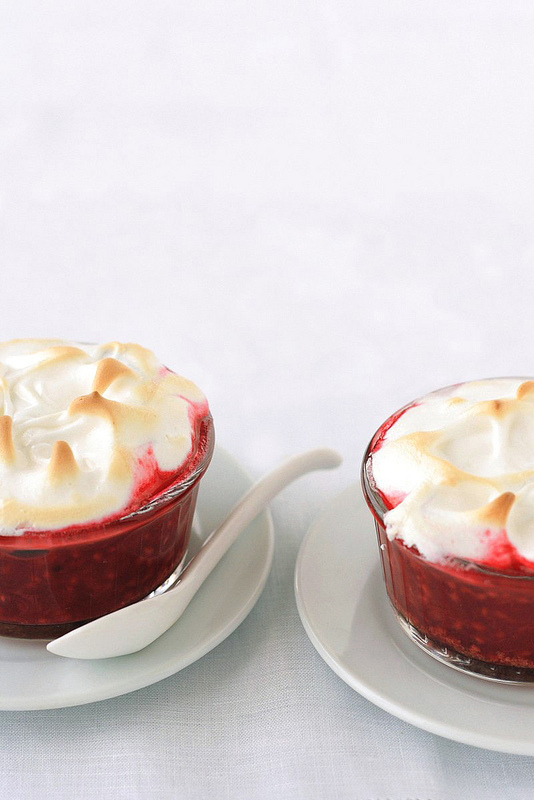 You can also make the fruit filling in advance and complete the pots with meringue right before serving. Amaretti biscuits should be available at fine coffee shops and in specialty food stores/sections. But if you can't find them, an equal amount of crushed almond biscotti should suffice. Or you could even bake your own! Preheat the oven to 425 degrees F. Place 5 Tbsp of the sugar, cinnamon stick, and vanilla in a medium sized saucepan with water. Gently heat until the sugar dissolves. Add the plums to the pan, bring to the boil, then simmer for 5 to 10 minutes, or until the plums have softened. Remove from the heat and stir in the frozen raspberries. Leave to stand for 5 minutes, then remove the cinnamon stick. Divide the crushed biscuits among six 6 to 7 oz. ramekins, and then spoon the stewed fruits over. In a clean, dry bowl, whisk the egg whites until it holds a soft peak. Gradually whisk in the remaining 1/2 cup sugar, and continue beating until you have a stiff, glossy meringue. Heap some meringue onto the top of each ramekin. Use a spoon to spread the meringue to reach the edges of the each ramekin and then to make pretty swirls ^_^. Place the ramekins on a baking sheet and cook in the oven for about 3 to 5 minutes, or until the meringues are golden but still soft inside. Serve immediately. Wonderful post Xialu, I love this beautiful treats. I can imagine how delicious they are. Isn't fresh fruit the "bees knees"? Nom nom nom! Lovely photos! Mmmm every photo looks so delicious! Raspberries are my favorite fruit... so making these will make my mouth very happy, haha! So beautiful and easy! But everything you do, Xiaolu, is amazing! I also want to say that I'm so happy I've been introduced to this blog since the first guest post. I'm enjoying everything so far! I see we share a love for fresh raspberries. This looks stunning! Great new way to try soemthing new with my raspberries! Oh these are pretty, too pretty almost too eat. What a great recipe michelle! Xiaolu is definitely one of my favourite bloggers! Now through the guest post, I got to know another! Awesome! Lovely pictures! I usually see "pot of..." something creamy, fatty, and rich (albeit delicious)- what a great idea to use fruits instead, keeping the delicious but forgoing the heaviness of "custardiness"! Cinnamon Swirl Cupcakes & Being a Guest!